Are you a graphic novel and comic fiend, like me? Have you read a few, but still don’t know how you feel about this format? Don’t know what the fuss is all about? Whatever your answer, join me for Get Graphic a new book club. We’ll read classic, groundbreaking, alternative, and mainstream graphic novels. We can all read the same title or you can pick one of your choosing and then share your reaction to it with the group. The choice is yours, and remember with great power comes great responsibility! Everyone is invited to attend this inaugural Game Night in the new Teen Reading Room. Put those nimble fingers to use and shred during Guitar Hero III. Flex your vocal chords with a Rock Band set. 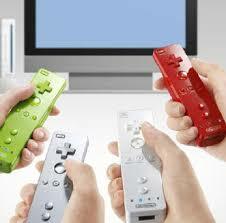 Showcase your Wii Sports skills. Tear up the track with Forza 2 Racing on one of our Xboxes. Whether you come as a spectator or participant, this night at the library is sure to be unforgettable! Age specific Game On! events are in the works, so come back for more.